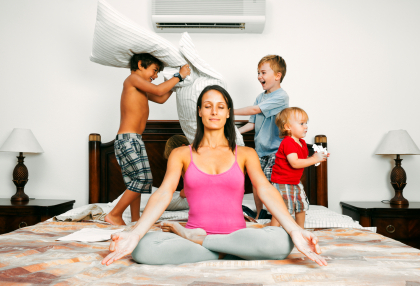 You Can Be A Mindful Family! At Perfectly Here, we understand that all members of the family should learn and use the skills of Mindfulness. Be A Mindful Family Program is our signature program. This program offers classes to enable parents and children to communicate with more ease and peacefulness. This is important, because the skills of Mindfulness can help manage one’s life including emotions, health and wellness, relationships, finances, schooling, etc. More effectively, studies show, that Mindful Awareness practices change the brain. New neuropathways begin to develop and being present becomes a new trait and part of the personality. Therefore, we have designed a full spectrum of classes for adults as well as children and youth to benefit from the trait of Mindfulness. Adults should also take our MAPS classes, designed by UCLA Mindful Awareness Research Center. Our Be A Mindful Family Program is taught by our competent teacher, Joel McNenny, PC. The Be A Mindful Family Program entails the following courses: Click on each course to see the details. For more information, please write to us at info@perfectlyhere.org or call us at (818) 453-0640. We commend your wish for a happier, healthier life. Be well.